Putting forward a local presence is becoming a global necessity. Whether through publications, a website, company documents, brochures, or newsletters, you need to engage with your prospective and existing customers in the right way, wherever they’re located. If you’re an American company or publisher trying to break into the UK or vice versa, you need to be sure that your approach and use of language is appropriate. I can help by providing comprehensive Anglicising, Americanizing, and localizing services to convert your content between US and UK English. You want to expand into a new marketplace and need to appeal to British or American customers. 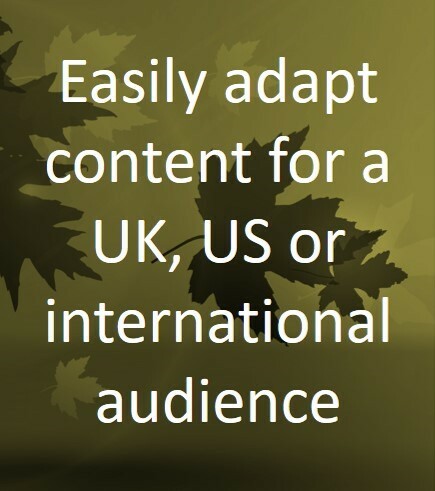 You need your content localized for a US, UK, or international English-speaking audience. You’d like me to copy edit, proofread, and localize your documents, articles, product descriptions, website, or similar content. You want to make sure that the spelling, punctuation, grammar, colloquialisms, and context of your work are right for your new audience. I edit, proofread, and localize all types, lengths, formats, and styles of non-fiction content including manuscripts, books, reports, websites, online content, documents, articles, essays, product and service descriptions, guides, presentations, and manuals. If it’s not on this list, ask me. Publishers and businesses can make significant returns on investment by expanding offerings internationally; you’ve already created the product or service, now you need to promote it to a wider audience. I give you the confidence that your copy will be edited, proofread, and converted between UK and US English. As part of my localizing services, I will correct spelling, punctuation, and other aspects of your writing to make sure that the grammar and style is right for your new audience. I also review any phrasing, cultural references, colloquialisms, or idioms, change them where necessary, and highlight any potential issues. Naturally, I’ll also proofread your content as well to ensure your words are free from errors. Copy editing and proofreading of easy to understand booklets on drug trials for young people and their families. Copy editing and proofreading of grant and funding proposals for business intelligence software development. Editing and localization of frequently asked questions and terms and conditions for a stock photo app. Copy editing and proofreading of executive reports on the capabilities of a new business intelligence software product. Learn about my areas of expertise. Copy editing and proofreading for customer-focused copy, including promotional and marketing content, online and offline articles, and proposals and grants. Copy editing and proofreading for Human Resources, employment, employer, employee, benefits, career, and leadership topics. Copy editing and proofreading for nursing, clinical, surgical, midwifery, mental nursing, healthcare, caregiving, and related topics. Copy editing and proofreading for health, wellbeing, self-help, nutrition, fitness, psychology, counselling, positive lifestyle, and similar topics. Copy editing and proofreading for software, SaaS, hardware, infrastructure, technical, engineering, or similar technology-related topics. Copy editing and proofreading for scientific, medical, pharmaceutical, psychiatric, experimental, research, and similar content. Copy editing and proofreading for classics, literature, history, geography, culture, arts, language, linguistics, music, dance, philosophy, and similar humanities topics. Copy editing and proofreading for journalism, communications, political science, economics, sociology, legal, teaching, education, and related social sciences topics. Copy editing and proofreading for all types of lifestyle content. Copy editing and proofreading for finance, financial management, accounting, bookkeeping, investing, and other money-related content. Copy editing and proofreading for various types of non-fiction content.